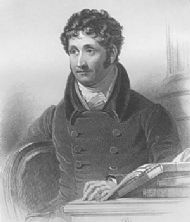 The poet Thomas Campbell (1777-1844) had two older brothers, Alexander (1761-1826) and John (1763-1806), who went to Demerara. Their father Alexander (1710-1801) was a Glasgow merchant trading with Virginia, where two other brothers established themselves. [Life and Letters of Thomas Campbell, William Beattie.] Their grandfather, Archibald Campbell [b.c1656], was the last to live on the family estate of Kirnan, near Lochgilphead. Alexander jnr was in Demerara from at least 1797, when his sister Elizabeth wrote to him there, and in 1799, his mother Margaret wrote of the upturn in his fortunes and his possible return to Scotland. He did, in fact, return and died in Glasgow. According to another source Alexander was in Berbice not Demerara [Literary Reminiscences and Memoirs of Thomas Campbell, Volume 1]. Thomas Campbell's first successful poem, The Pleasures of Hope, published in 1799 contained a condemnation of slavery and the slave trade. Weigh'd in a tyrant's balance with his gold ? No!—Nature stamp'd us in a heavenly mould ? To call upon his country's name and weep! The poem contains references to the practice of calling slaves to work by sounding a horn and to the rites of Obiah, derived from African religion, which Campbell explained in footnotes.